As if the market needed something else to spur volatility, The Bank of Japan chose tonight to cut the size of its purchases of 5-to-10 year JGBs (from 450bn to 430bn yen). While yen initially strengthened, it is now tumbling and Japanese stocks absurdly rallying, presumably because yields on the bonds are rising. 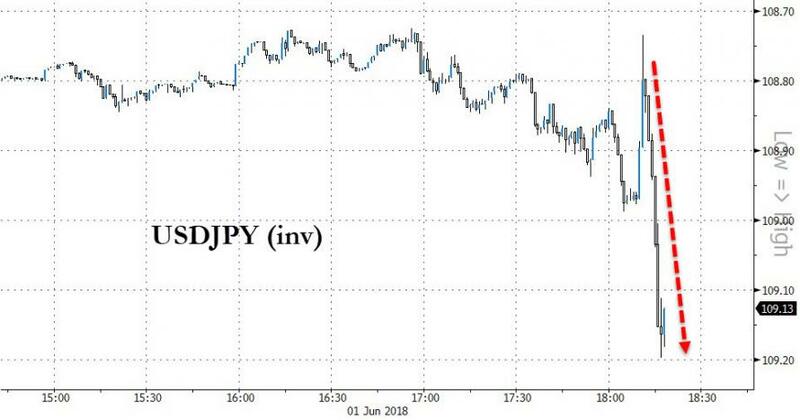 And stocks jumping... Look what you have done Mr Kuroda. Bloomberg's Mark Cranfield notes that the BoJ's timing coincides with the JGB contract trading near the top end of its range for this year, which suggests net market positioning had been skewed long. 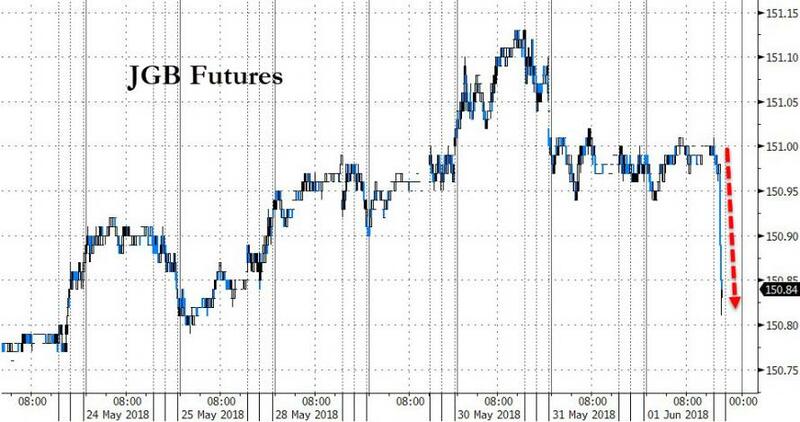 As one veteran trader noted: "this would be the perfectly bad timing to cause a JGB VaR shock: just as Italy and Spain get anti-establishment govs, as Trump declares trade war on the world, and as US payrolls looms." But on the bright side, he added, "at least we will get some volume in JGB markets tonight." 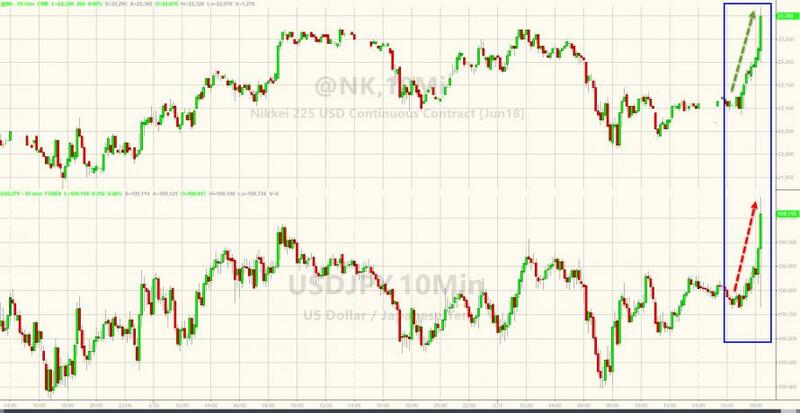 Interestingly, some analysts see this as a victory for Kuroda - enabling him to tighten policy (normalize bond-buying further), because while bonds fell after the Bank of Japan’s surprise reduction in debt purchases but the limited reaction in the yen may pave the way for more cuts. ”It’s a victory by the BOJ, given the market consensus is that the bank can’t act as long as there’s wariness over yen appreciation. Yet the yen barely budged” and instead weakened. Naoya Oshikubo, rates strategist at Barclays Securities Japan, said that while there’s still wariness over yen appreciation, excessive risk aversion related to Italy’s political turmoil appears to have abated, which may have played a part in BOJ’s decision to cut.